Wedding ring made wider to space the third ring and reduce rubbing. Height of the setting increased slightly and diamond/claw spacing corrected. This ring had been badly damaged to being worn next to a third ring not pictured that it was never made for. I made some slight changes to the height of the cluster to correct this. The wedding ring was also slightly widened and the old engraving replicated. 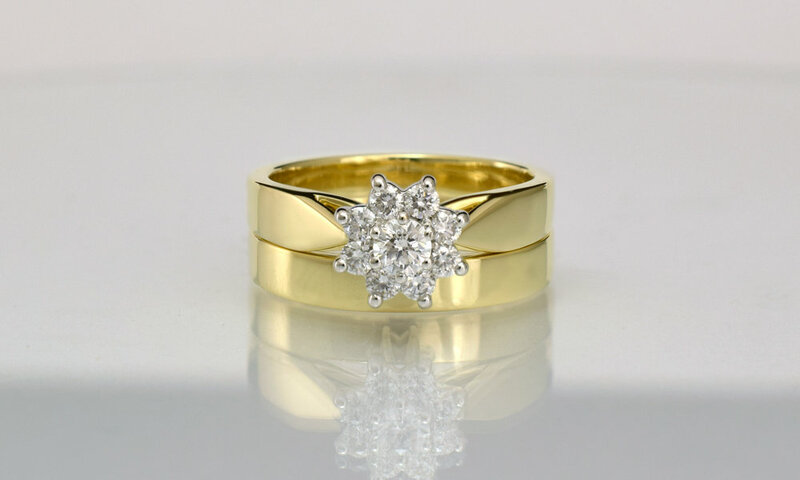 The engagement ring was originally 14ct gold and the wedding ring 9ct. I remade both rings in 14ct yellow gold to match.